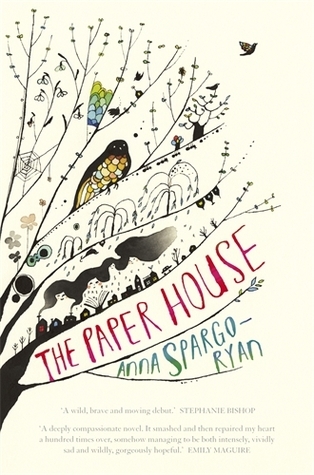 Ever since Anna Spargo-Ryan popped up on my Twitter radar sometime early last year, I have been dying to read her debut novel, and now I finally have! Aside from its gorgeous cover, this book features some of the most glorious, original, beautiful prose I have ever had the pleasure of reading, and I can say now that The Paper House was certainly worth the wait. The book follows Heather and Dave, who find themselves the perfect house and begin preparing for the new life and their new family there. But when tragedy strikes, everything about this new life becomes unfamiliar to Heather. Her whole family is worried about her; her rough, unsentimental sister, Fleur, who takes time off from her farm to come and stay with them; her father, who turns up at the door in a florid Hawaiian shirt; Dave, who is sweet and charming and perfect and in many ways has to subvert his own grief in order to support Heather through hers. As Heather navigates a phase of her life she'd never had to plan for, her new home wraps itself around her. Meanwhile, old memories begin to play in her mind. While the story of this novel is deeply moving, it was the sheer brilliance and originality of the writing style that had me dumbstruck as I raced through. Each metaphor, each description, was stark and dazzling and beautiful. I am equal parts inspired by Spargo-Ryan's writing and depressed that I will probably never be able to achieve this in my own work. I don't think that there is anyone out there who writes quite the way she does, and I mean this as the highest compliment. Add to this that The Paper House takes an issue that in many ways could be categorised as an issue for 'women's fiction' and makes it literary and universal and magical, and I think she has accomplished something amazing. There has been a lot of talk lately about middlebrow books, and I think The Paper House has well and truly found its place alongside other novels that some have classified as such, but are in fact wonderful masterpieces of the Australian literary fiction scene, books like The Other Side of the World by Stephanie Bishop and Lost and Found by Brooke Davis. I'm no fortune teller, but I definitely see prize shortlistings in this book's future. To those readers who are put off by how sad the premise of this book seems, I urge you to overcome that and allow this remarkable book to take you through a myriad of emotions. Heather and Dave's journey is sad, yes, but it is a book that deserves to be read and read and reread until the book's beautiful covers crumble and fall off. This is truly a stunning debut and I cannot wait to see more from this rising Australian star. I gave it five stars but only because that's as high as goodreads would let me.